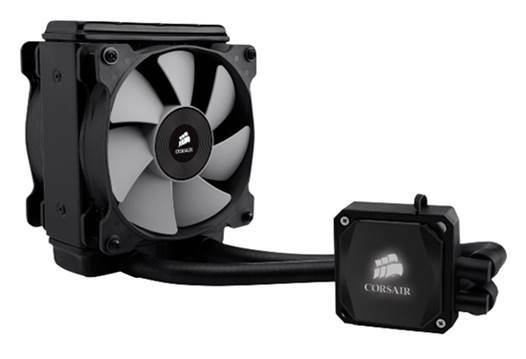 When corsair released its closed loop H80 water cooler in 2011. 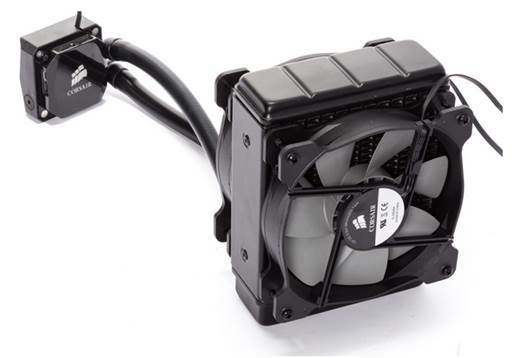 We found it to be one of the best-performing dual-fan kits available. It was also very loud at full blast and cumbersome to install. The updated H80i model sets out to address these issues while also improving performance. At first glance, the H80i doesn't appear to differ much from its predecessor, but there are a number of key upgrades. First, at 1.4cm thick, the coolant tubes are nearly twice as fat to help increase coolant flow. Also, the two 12cm fans are now based on Corsair’s high-static-pressure Air Series SP120 fans and run a bit quieter than the previous model’s fans. Finally, Corsair now includes its Corsair Link software with the kit, rather than making it an expensive add-on, allowing you to control all the functions of the kit from within Windows. The software provides a range of controls for fan and pump speeds and overall performance, its coolest feature being the ability to customize color changes to the logo on the water block according to CPU temperatures. For anything below 70 C, we had the light shine blue and anything above displayed red. At first glance, the H80i doesn't appear to differ much from its predecessor, but there are a number of key upgrades. Corsair has gone to great lengths to simplify the installation process, as it includes one of the best manuals we've seen, with clear instructions and excellent diagrams, and the parts are all easy to combine, as well. First, you attach a back-plate (the H80i supports all modern CPU sockets except for Intel’s LGA775), then tighten four standoffs around the CPU socket. Where Corsair has really simplified things is with its magnetic mounting bracket, which just slides onto the top of the water block until it snaps into place. Mounting the water block onto the CPU also requires just four screws, and then eight screws are needed to sandwich the radiator between the two fans and the chassis. The last step is to plug the fans into the water block and connect the system’s three cables (SATA for power and fans; USB for the software) into their respective plugs. Though that's more cables than we’re used to seeing for a CPU cooler, the added functionality they offer is worth it. The Corsair Link software offers you a choice of more than a half-dozen preset fan speed profiles (Quiet, Performance, Balanced, and more] and also allows you to customize and save your own presets. You can set individual fans to specific RPMs, or set specific temperature ceilings at which they spin up. The icing on the cake is that the highly tweakable software is easy to use. When we set the kit to quiet mode using Corsair Link, the cooler was near silent and outperformed our zero-point Hyper 212 Evo air cooler by almost 4 C under load. When we switched to performance mode, the fans revved up appropriately and sounded like a small wind tunnel, but its cooling performance was unmatched in its class, beating its very cool predecessor by roughly 3 C, and Thermaltake's Water2.0 Pro dual-fan kit by U C. It also decimated our zero-point air-cooler by over 11 C.
The H80i isn't without its issues. At 110 bucks, it’s expensive, and it should include a software CD (the software is available as a download], but those are our only complaints. We like that it has the flexibility to be either super cool under load or amazingly quiet at idle, and everything in between, thanks to its elegant software. When you factor in its simple installation process and nifty LED options, it's clear Corsair has a winner on its hands with the H80i. The H80i isn't without its issues. At 110 bucks, it’s expensive, and it should include a software CD (the software is available as a download], but those are our only complaints.